Enjoy outdoor seating that's built for comfort with this seven-piece outdoor set from Living Source International. 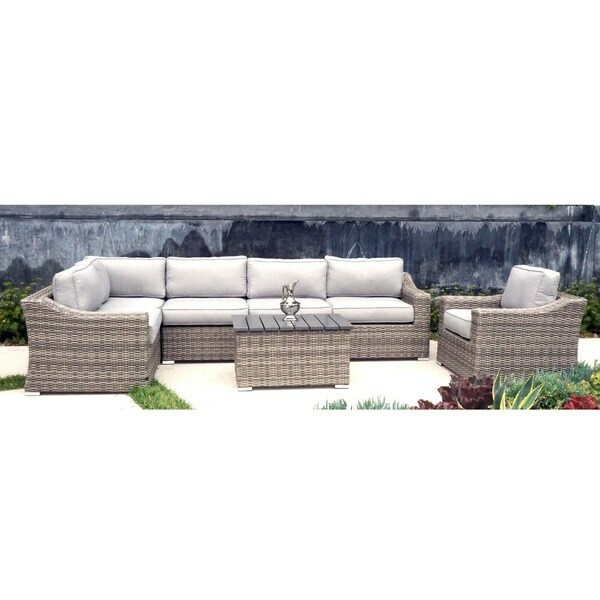 Made of hand crafted, weather-resistant rojnded wicker over durable aluminum, this resort-quality set features an L-shaped couch, matching chair and table to accommodate the whole family. "I'm looking at the Patio Sofa Set, Marina Conversation Wicker 7-piece Club Set, do the pieces come with anything to clip them together? Also, it says the color is gray but looks to be a mix of tans/grays, can you please let me know if that is more the true color. Also the height of seating says 25.5, is that including the cushion height or is that just the furniture base? As for the measurements, for the shorter side, I interpret that would be a total of 66 inches (one corner, one right arm) and the longer end would be a total of 120 inches. (one corner, 2 middle and one left arm). One more question, cushion color appears to be like an oatmeal/wheat to me. Is that true or is it more of a white or off white. Can you please confirm all of this as it is such a big purchase. If you can, please let me know if for some reason it needed to be returned, how much the cost would be to me. Thank you so much." "This says 5 piece and brown I am looking for grey do you have it in grey "